Set the Chardonnay aside for now and reach for a Pinot Gris or dry Riesling. Get our top picks. Sure, a big, buttery Chardonnay goes with fresh cracked crab, but Pinot Gris and dry Riesling also have a rich mouth-feel and often more vibrant layers of fruit. Pour a Gris if the crab is cold (and has a lemony aioli on the side), and a Riesling if it’s warm (with clarified butter). Claiborne & Churchill Dry Riesling 2005 (Central Coast; $18). Crisp but honeyed white peaches mixed with limestone. 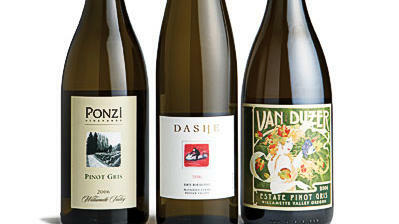 Dashe McFadden Farms Dry Riesling 2006 (Potter Valley; $20). Crisp and dry, with beautiful aromas of stone fruit (white peaches, apricots) and honeysuckle, balanced with bracing Key lime zest. Etude Pinot Gris 2006 (Carneros; $24). Full-bodied and rich, with a burst of Meyer lemon backed by faint pear, honeysuckle, and flint. J Pinot Gris 2006 (Russian River Valley; $20). What Pinot Gris should be: gentle citrus and delicate tropical fruit with a complex underlayer of other orchard fruits and a crisp, refreshing finish. Ponzi Pinot Gris 2006 (Willamette Valley; $17). A delicate Gris that manages loads of fruit―lemon, pear, apple―plus a touch of honeysuckle. Van Duzer Pinot Gris 2006 (Willamette Valley; $16). Edgy citrus and stone fruit are set off by an interesting minerality.